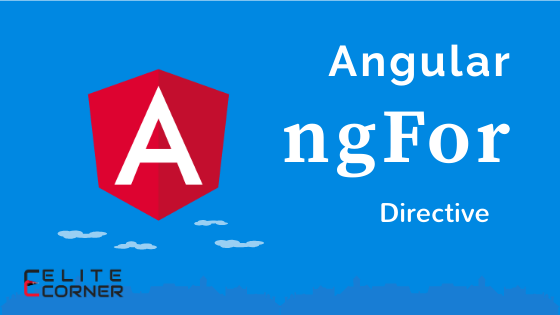 In this article, we'll see how to use angular's ngFor directive. ngFor is angular's builtin structural directive which renders a template for each item of the supplied array. The output of the above code will look something like this inside HTML. Now let's understand how the following code works. products is the array that contains the list of product item. of products means it will iterate over the products array. let product creates the local variable named product which is having scope inside the <li> tag only where ngFor is defined. index : number: The index of the current item in the iterable. even : boolean: True when the item has an even index in the iterable. odd : boolean: True when the item has an odd index in the iterable. first : boolean: True when the item is the first item in the iterable. last : boolean: True when the item is the last item in the iterable. Now let's see an example with each of the above variables. <li *ngFor="let product of products; let f=first; let l=last"
In this way, ngFor change propagation works. This is fine for the small array, but if we have a huge list of the array, it definitely creates the performance issue. Imagine if you have a large list of the array and if you are updating one of the items inside array, Angular needs to remove all the DOM elements that associated with the data and create them again. The solution for the above problem is trackBy. trackBy takes a function that has two arguments: index and item. If trackBy is given, Angular tracks changes by the return value of the function. If new item is added to the array or removed from the array or any update to the item then angular will keep track of that item using supplied value of trackBy function. Here in the above code we've define to track the item by index.